Happy Vishu & Sarvadhari New Year! Happy Vishu and Sarvadhari New Year to all of the viewers and readers of Thiruman.com and it’s other sites! This year, Vishu fell on 14th April 2008 which was also Sri Ramanavami. During Vishu, it’s our custom to observe ‘Vishu Kani Kanal’ which means ‘first sight’ just after you wake up in the morning. You can read more about it from this site. 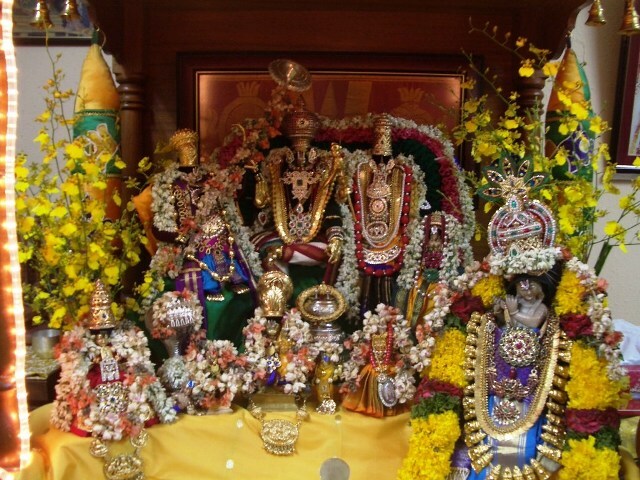 In my home alter, Perumal (my principle deity) is usually decorated as Krishnan or any other alangaram that is depicted in Krishna avatharam. But this year, since Ramanavami also fell on the same day, the importance was given to Perumal to be decorated as Sri Raman. The particular alangaram I chose was Sri Ramar Pattabishegam. This year’s ‘Kani Kanal’ was double special as our first sight was on both Sri Ramar and Sri Krishnan!. Here’s a picture of the decoration that was set up for Kani. It was really a sight to behold!! In the background (clockwise) – Sri Devi decorated as Sri Lakshmanan, Sri Srinivasa Perumal as Pattabishega Ramar, Sri Bhu Devi as Sri Sita and Sri Hanuman. In the forground (clockwise) – Sri Mahalakshmi, Santana Gopala Krishnan, Sri Srinivasa Perumal (Selvar), Salagaramam on Seshaasanam, Sri Lakshmi Narashimar, Sri Neela Devi, Sri Andal and Sri Krishnan. May Sri Srinivasa Perumal shower his blessings on everyone and make this year a special one for all! I was very busy the day I got back from India. For the last 2 weeks, I have been busy with helping out in some alangaram for 2 functions. I will try to upload the pictures soon. Apart form this, I had a good darsanam in Srirangam and Srivilliputtur! A warm welcome to everyone!. This Weblog is an extension of the www.thiruman.com website. I will share updates from thiruman.com and introduce new sites with a little introduction. Please visit and subscribe to this Weblog!.